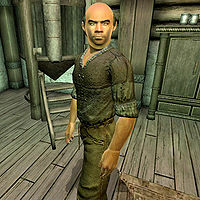 Snar the Cook is a Nord farmer working as a cook at the Jerall View Inn in Bruma. A newcomer from Skyrim, Snar the Cook has brought all of his homelands culinary traditions with him, which might explain the inn's popularity among the Bruma citizens. His private quarters are located right next to the kitchen and he sleeps there every night between midnight and 6am. After waking up, he starts his thirteen-hour workday, where he spends most of his time in the kitchen, but also in the dining area. At 7pm, he finally leaves the inn and takes a stroll in the area near Regner's house. He returns to the inn at 9pm, grabs the bottle of mead from his bedside table and sits down for two hours of drinking. At 11pm, he returns to his duties in the kitchen until he goes to bed at midnight. He wears a set of lower class clothing, a burlap vest with sack cloth pants and a pair of clogs. He carries around a small amount of gold. When you meet him for the first time, he can't help but advertise a bit about his specialty: "I'm Snar the Cook. We've got genuine Skyrim cuisine... fresh, simple, big helpings... just like Mom used to make." And when asked about his city of choice he will say: "We're still in Cyrodiil here in Bruma, but just barely. We build for the cold, just like in Skyrim." This page was last modified on 22 June 2018, at 04:34.